Historically, it would be more unusual for US President Trump to have a State Visit, or make an address in Westminster Hall, than not. The furore surrounding President Trump’s executive order on immigration, and the UK Government’s response to it, has two parliamentary aspects. First, opposition to President Trump’s planned State Visit snowballed in recent days in large part through the galloping rise in the number of signatories to an e-petition on the subject, now standing at over 1.5 million. Like other e-petitions, the anti-State-Visit petition is hosted on Parliament’s website and handled in the first instance by the House of Commons Petitions Committee, which must now decide how to respond. (This relatively new e-petitions system was launched in 2015 on the back of recommendations in our report ‘What next for e-petitions?’.) As the issue prompted a three-hour emergency debate in the Chamber yesterday, the Committee may decide that further debate is unnecessary, and look instead at alternatives – perhaps, for example, referring the issue to a relevant select committee for investigation. Second, there is the question of whether, if President Trump comes to the UK, he should address Parliament, and if so, whether he should do so in Westminster Hall, the oldest part of the parliamentary estate. While the Government is holding firm in keeping open the State Visit invitation, no specific plans have been confirmed so far as to President Trump’s programme in the UK. A state visit is a very distinct type of event. Just because a foreign head of state is in the UK, s/he is not necessarily on a State Visit. As former diplomat Charles Crawford has pointed out, State Visits are distinct from low-key ‘working visits’ and somewhat grander ‘official visits’. A State Visit to the UK formally takes place at the invitation of the Queen, not the government; and the Queen, not the government, is formally the host. State Visits are too few and too inflexible, in terms of the amount of notice and preparation time involved, to be part of the normal dealings between the government and its international partners. Instead, they are allocated carefully between countries and planned long in advance, with the Queen issuing an invitation on the advice of the Foreign and Commonwealth Office (FCO). Buckingham Palace’s list of inward State Visits since the Queen’s accession in 1952 shows that until 1988 there were at most three such visits a year, and since then at most two. This generates a total of 109 inward State Visits since 1952 (including that of President Santos of Colombia in November 2016, not yet included on the list). Only two of these 109 State Visits have been of US presidents – President George W. Bush in 2003, and President Obama in 2011. None of the other ten post-1952 US presidents had a State Visit to the UK. As confirmed by a handy list on the website of the US Embassy in London, US presidents have made many, often memorable, visits to the UK; but when President Reagan went horse-riding at Windsor Castle, President Clinton went walkabout in Oxford, or JFK visited Harold Macmillan at his Birch Grove home in Sussex, none of them was on a State Visit. The country that has enjoyed the most post-1952 state visits to the UK is France, with five, including all but one (Pompidou) of its Fifth Republic presidents. France is followed by Germany, Italy, Saudi Arabia and – intriguingly – Mexico, all with four. The share of state visits enjoyed by leaders of European countries has ranged from 57% in the 1950s, and 41% and 44% respectively in the 1960s and 1970s, to 25% in the 1980s, 42% in the 1990s, 33% in the 2000s and 7% so far this decade. By definition, the 15 non-UK Commonwealth realms of which the Queen is head of state cannot have a State Visit. There are some elements of a State Visit to the UK that are pretty much automatic – a State Banquet at Buckingham Palace and an inspection of a Guard of Honour on Horse Guards Parade, and normally also a banquet hosted by the Lord Mayor of London at the Guildhall. A formal address to the two Houses of Parliament is not among these elements. Only a very few inward State Visits have included a formal address to the two Houses. 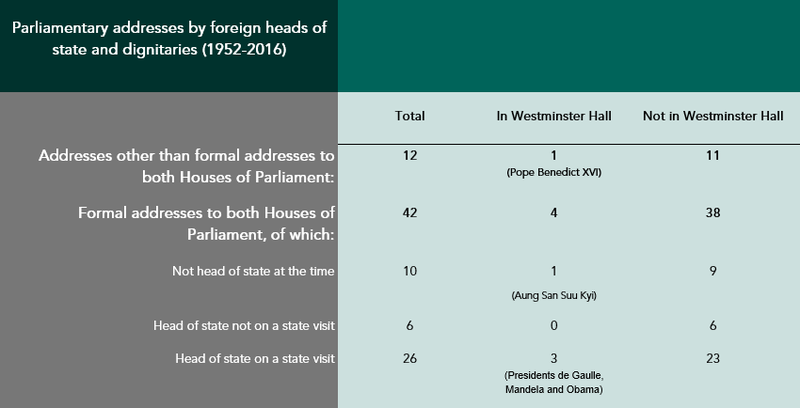 Cross-checking Buckingham Palace’s list of inward state visits against the House of Commons Library’s list of formal addresses to the two Houses reveals that heads of state on a State Visit have made such addresses 26 times since 1952, out of the 109 state visits. The 26 includes President Obama’s address in 2011 – the only time a US President on a State Visit has addressed Parliament. Equally, a foreign head of state may formally address the two Houses of Parliament when s/he is in the UK on something other than a State Visit. There are six cases in this category, including the two other occasions on which a sitting US President addressed Parliament, President Reagan in 1982 and President Clinton in 1995. Whether a foreign head of state addresses Parliament, during a State Visit or otherwise, is part of the negotiation of his or her UK programme between the FCO/Number 10 on the one hand, and his or her office on the other. Whether an address is included in the programme may be a matter of the time available, whether Parliament is sitting or in recess, the visitor’s preference, and early soundings via Black Rod as to the views of the two Speakers. In 2003, it had originally been thought that President Bush would address Parliament, but the event was ultimately not included, apparently because of fears about likely protests against Mr Bush and the Iraq War. If it is agreed between the UK government and the visiting head of state that the programme should include a formal address to Parliament, the decision as to whether to issue an invitation rests formally with Parliament, in the shape of the Speakers of the two Houses. In the case of a State Visit, the Lord Chamberlain’s Office writes to the two Speakers on behalf of the Queen to ask them to host her visitor. As far as it is possible to tell, such a request has never been declined. In the case of a visit other than a State Visit, the request to the Speakers comes from the Prime Minister. Even a formal address to the two Houses by a head of state on a State Visit does not automatically take place in Westminster Hall. Addresses by foreign dignitaries in Westminster Hall are extremely rare. The tally is five since 1952: three by a head of state on a State Visit (President Obama in 2011, President Mandela in 1996 and President de Gaulle in 1960), one by someone other than a head of state (Aung San Suu Kyi in 2012) and one in 2010 by Pope Benedict XVI, a head of state but not on a State Visit and on this occasion, according to the House of Commons Library, technically not making a formal address to the two Houses. By contrast, the roster of heads of state on State Visits who have given formal addresses to the two Houses away from Westminster Hall, in the Royal Gallery or Queen’s Robing Room, includes Presidents Chirac, Giscard d’Estaing, Hu, Lula, Mitterrand, Sarkozy, Weizsäcker and Xi. King Abdullah of Jordan, on a State Visit in 2001, gave a formal address to parliamentarians in a committee room. Presidents Reagan, Clinton, Yeltsin and Peres, not on State Visits, also all made formal addresses in the Royal Gallery or Robing Room, as did non-heads of state such as Chancellors Brandt and Merkel and Prime Minister Modi. Which room is used for an address to Parliament by a visiting foreign dignitary is largely, if awkwardly, a matter of the likely size of the audience. Only the biggest draws are likely to fill the vast space of Westminster Hall – the Wembley Stadium of the parliamentary circuit. (The combined full membership of both Houses is currently 1,455, which in the cases of addresses by leading foreign figures would be augmented by officials, diplomats, invited dignitaries and the media.) But because of Westminster Hall’s historic place at the centre of English and then UK public life, addresses there are also of particular political significance, and the opportunity to make one is not offered lightly. As with all other elements of any high-level visit, officials pay careful attention to precedent, so as not to be seen to be favouring one visitor unduly. Formally, the decision as to whether to use Westminster Hall is a three-way one, between the Lord Great Chamberlain (on behalf of the Queen) and the two Speakers. Perhaps bringing matters back to Mr Trump, on at least one previous occasion the use or not of Westminster Hall reportedly became contentious, when President Reagan wished to speak there but the then Labour leader Michael Foot blocked the House of Commons’ agreement. This ultimately obliged the President to content himself with the Royal Gallery.